Economic gold mineralization in Mali is confined to two terranes of Birimian-aged (Paleoproterozoic) rocks in the south and south-west of the country. The West Mali gold belt, along the border with Senegal, hosts two world-class orogenic gold districts (>5 Moz of Au mined or in reserve): the Loulo-Gounkoto and Sadiola-Yatela complexes. This gold province is hosted within greenschist metamorphosed siliciclastic and carbonate sedimentary rocks along the eastern side of the Kédougou-Kéniéba inlier, with mineralization linked to higher-order shears and folds related to the Senegal-Mali Shear Zone. Gold deposits within the West Mali gold belt show many features typical of orogenic gold mineralization, such as geological setting (accretionary orogen), late-orogenic timing (strike-slip deformation; post peak metamorphism), structural paragenesis, and deposit geometry (steep, tabular ore bodies). However, alteration assemblages (tourmalinization, silica-carbonate, sericite-chlorite-biotite, calc-silicate) and ore fluid compositions (carbonic-rich and high-salinity aqueous-rich fluids) are highly variable along the belt. Fluid inclusion and stable isotope studies have shown that this variability is caused by multi-fluid sources, with magmatic, evaporitic and regional metamorphic fluids all likely contributing to gold mineralization within the region. Supergene enrichment of the orogenic gold lodes is economically important in the northern parts of the West Mali gold belt, involving karstification of mineralized limestones. 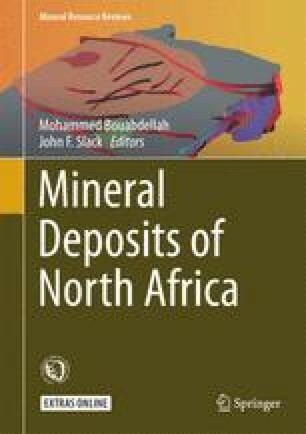 In addition to orogenic gold deposits, other styles of gold mineralization have been reported within the Birimian crust of West Africa. The Morila gold deposit, in southern Mali, is classified as a reduced intrusion-related gold system, in which strata-bound Au–As–Sb–Bi–(W–Te) mineralization formed early in the Eburnean orogenic cycle (syn-metamorphic) with spatial and genetic links to syn-orogenic granodiorites and leucogranites.